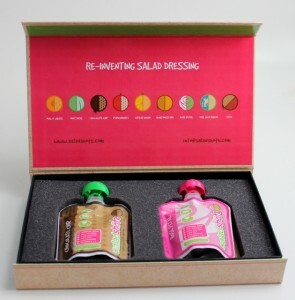 Here is a packaging solution from Sunrise Packaging, Inc. that we did for Salad Shots specialty, gourmet salad dressings. This application of the NetBox™ shows us just how versatile it can be. While we normally create cigar-style boxes for marketing kits, disc or USB drive media, this project is unique in that it holds a retail item being marketed to grocers. By using full color digital print, the company was able to submit their artwork to us for an easy printing process. The paper wrap then went to our turned edge department where the print was applied to the chipboard eventually becoming a high-end hard cover box ready for presentation. 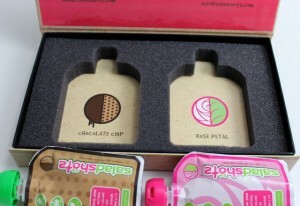 Holding the various flavors in place is a custom die-cut foam insert. One of the most popular choice to hold things in place, Sunrise offers a huge variety of foam options to match the entire packaging set for cohesion. 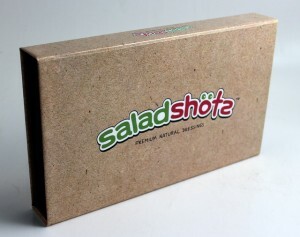 Take a look at how the NetBox™ worked for Salad Shots, and how it can work for you!